If you’re a writer living in California, Oregon, or Washington, you’ve no doubt read and submitted to ZYZZYVA, the venerable and daring literary magazine of west coast writing. But the magazine isn’t just for those of us on Pacific Standard Time — this gold is for everyone! For twenty-nine years ZYZZYVA has published such acclaimed writers as Sherman Alexie, Robert Hass, and Ursula K. Le Guin, and they’ve just put out their 100th issue with contributions from Rebecca Solnit, Daniel Handler, and more. 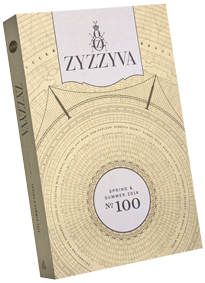 In anticipation of ZYZZYVA’s May 8th gala to celebrate this milestone, I asked editor Laura Cogan and managing editor Oscar Villalon about the magazine’s history and future, and its essential role in the west coast literary scene. The Millions: Howard Junker founded ZYZZYVA in 1985, and he was famous among west coast writers for his devotion to the literary community, as well as his light speed response time regarding submissions. He always signed his rejections “Onward!” which would never fail to cheer me up a bit. How has ZYZZYVA changed — and how has it remained the same — since you and Oscar Villalon took over the magazine in 2011? Laura Cogan: It’s a tremendous honor and challenge to step in for a founding and longtime editor. This journal has always had a unique character, a determined and spirited kind of non-conformist aesthetic. The task that confronted us, as I saw it, was to continue ZYZZYVA’s proud traditions, and to look at what could be done to help the journal thrive and grow through this transition. The literary pedigree of the journal was well established, and the history of championing new and emerging voices was as well — and Oscar and I have sought to continue these traditions. We did set out to bring renewed and vigorous attention to a few aspects of the journal: we looked for ways to upgrade our print edition; we knew we needed to redesign and re-envision the website; and it was important to both of us that we do even more to be part of the community. To that end, we redesigned the website and the print journal with Josh Korwin at Three Steps Ahead, and we developed a robust calendar of events, the vast majority of which are free. Throughout the changes we made, I was constantly thinking about the journal’s history, and trying to honor it. When we did the print redesign, I brought in the first issue of the journal as a touchstone. Though what we have now looks very different in some ways, the design process itself was never a matter of starting from scratch; it was always about drawing on our history, and taking the next step. As for our rejection letter: it has changed a bit, but we hope it is still just as encouraging. TM: Over the years, ZYZZYVA has published a bunch of new voices, and in your table of contents you highlight which writers are in print for the first time. Why the emphasis on new talent? How does it fit into the magazine’s overall identity? Oscar Villalon: I think that a large part of the mission of a literary journal is to introduce emerging writers. It’s hard to think of a more ideal setting for presenting new talent: a journal with a passionate audience and attentive editors, to say nothing of having your work published along with the work of established authors, thus giving some sort of context for how highly we think of the quality of this new writer’s work. I hadn’t really thought about it before, but if you consider how the journal was created to nurture West Coast writers and artists who might be otherwise overlooked by the literary community in, say, New York — or that the journal’s mission is to provide a sense of how enormously vital and robust the literary community out here is to both members of that community and folks living outside of it — then it makes complete sense that we should be so adamant about finding and publishing new voices. Discovery is so essential to literature, as it is to any other field. To keep things fresh, to keep things interesting, you must bring more people into the conversation, so to speak. TM: When I was a student at Iowa, I couldn’t wait to get back to California so I could submit to ZYZZYVA again. I’ve always loved your focus on west coast writers — selfishly, yes, but I also admire it for the community it creates. I am curious if you and Laura have certain grand ideas of what it means to be a west coast writer; are there certain modes — in style, content, theme, and so on — that you see as being organic to the west coast? Beyond that it’s hard to say what sorts of writing are exclusive to us as originators, but I can say that it’s hard to think of a single mode in American literature and letters that at this point isn’t organic to the West Coast: you name it, there’s a writer here who has published a work about it. All the varieties of the American experience — every ethnicity, every race, every sexual orientation, every social class, etc. — is represented. Western authors do scholarly and rigorously intellectual work, along with commercial available-at-the-supermarket fare. Poetry — we have such incredible poets, and a long line of them, too! — of every kind is forged here. What I’m getting at is that just like the region we live in, the field is wide open here. There’s nobody looking over your shoulder to tell you what will work or won’t. All we do out here is take risks and follow our instincts for pursuing what we believe to be good, to be important. So I suppose if we have any sort of grand idea of what it means to be a West Coast writer, it is one of a writer blessed with limitless possibilities and one encouraged to follow her own path, to surprise us. Where we live encourages you to think that way, partly because the literary community out here is vastly supportive, and partly because you’re not living under the constant pressure of careerism. That is, there are so many things going on in the West Coast (tech comes to mind) that whether or not your book sold well or your story was taken by a glossy magazine doesn’t register. We’re not working in an echo chamber out here when it comes to that. TM: The redesign of the magazine is…well…cool! I’ve noticed that many literary magazines in the past few years have stepped up their game in terms of design and packaging. Is this the McSweeney’s effect? How do you see format relating to the content of each issue? Do you have any future goals in terms of your online presence? Laura: I think the writing has been on the wall for some time now: print publishers need to think much more deliberately now about what their audience desires from a printed object. If a reader is choosing to read in print, rather than in any other format, why are they doing so — and what can we do to make print as satisfying an experience as possible? With a small staff and limited resources, it can feel daunting to have to pay such close attention to design — but we’ve also found it to be an extremely rewarding creative project. Working together with Josh, our brilliant production designer, we made some fairly bold moves with the redesign, but our process was anchored in respect for the original design and vision of the journal. That through-line may not be entirely evident on the outside, but it was essential in guiding all our internal decisions. And while we’ve had some fun with the covers and details like mock-endpapers, the interior design is really all about letting the content shine, and creating a space for serious reading. We sought to keep a quietude and elegance to the prose and poetry presentation, and we looked for ways to deepen our commitment to the visual arts. TM: You’ve just published the 100th issue, which includes, among other stellar work, a profound and playful essay on death by David L. Ulin, and a poetic and beguiling short story by Elizabeth Tallent. How did you decide what went into this anniversary issue? Judging this issue alone, how would you characterize the magazine’s point of view? Laura: I don’t think Oscar and I are trying to present our readers with a particular point of view. We’re not trying to communicate a message to our readers through our choice of material and editing of manuscripts — at least, nothing more specific than the simple but rather bold assertion that this work is worth your time. I think we are both serious, avid, and curious readers with a deep appreciation for the many ways that storytelling can work, and for the profound ways in which reading literature can deepen our entire experience of life. I think we both feel strongly that there is a great deal of fine work coming from contemporary authors. As the editor of a literary magazine, your ability to recognize quality in a range of styles should grow naturally out of a desire to find the best of what’s out there, a desire to keep the selection varied and stimulating; it should grow naturally out of your own interest in discovering new voices. This work of being an editor demands an adventurous spirit and a willingness to stand behind and champion work that has not yet been recognized as substantial or worthy by any kind of establishment, much less made its way into the cannon. I think being inherently interested in a range of styles and voices makes an editor a good fit for curating a literary magazine — where each issue should really serve as an anthology of the finest works of that moment. The legacy of racist violence in this country bears heavily on my thinking when I’m casting about for ideas for my novels. I’m always thinking about race, violence, the history of the South, and how that history bears on the present.